Charles Henry Gordon-Lennox, 6th Duke of Richmond, 6th Duke of Lennox, and 1st Duke of Gordon, KG, PC (27 February 1818 – 27 September 1903), styled Lord Settrington until 1819 and Earl of March between 1819 and 1860, was a British Conservative politician. Born at Richmond House, London, he was the son of Charles Lennox, 5th Duke of Richmond and Lennox and Lady Caroline, daughter of Field Marshal Henry Paget, 1st Marquess of Anglesey. He was educated at Westminster and Christ Church, Oxford, where he had a short career as a cricketer. He served in the Royal Horse Guards and was aide-de-camp to the Duke of Wellington. March entered politics as member for Sussex West in 1841. He was sworn of the Privy Council in 1859. In 1860, he succeeded his father as Duke of Richmond and entered the House of Lords. 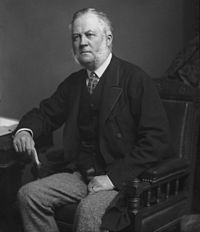 He chaired the Royal Commission on Capital Punishment, which reported in 1866, and the Royal Commission on Water Supply in 1869, which concluded that there was a need for some sort of overall planning of water supplies for domestic use. He was made a Knight of the Garter in 1867, and filled various positions in government in the Conservative administrations of the Earl of Derby, Disraeli and the marquess of Salisbury. In 1876 he was rewarded for his public service by being created Duke of Gordon and Earl of Kinrara in the peerage of the United Kingdom. He was also Chancellor of the University of Aberdeen from 1861 until his death at Gordon Castle in 1903. Garter encircled arms of Charles Gordon-Lennox, 6th Duke of Richmond, KG, as displayed on his Order of the Garter stall plate in St. George's Chapel. Lord Algernon Charles Gordon-Lennox (19 September 1847 – 3 October 1921), married Blanche Maynard and had issue one daughter, Ivy Gordon-Lennox, (16 June 1887 – 3 March 1982), who m. William Cavendish-Bentinck, 7th Duke of Portland. Porter, Elizabeth (1978). Water Management in England and Wales. Cambridge University Press. ISBN 978-0-521-21865-8. Torrance, David (2006). The Scottish Secretaries. Birlinn. ISBN 978-1-84158-476-8. ^ Porter 1978, p. 24. McNeill, Ronald John (1911). "Richmond, Earls and Dukes of" . In Chisholm, Hugh (ed.). Encyclopædia Britannica. 23 (11th ed.). Cambridge University Press. p. 307. One or more of the preceding sentences incorporates text from a publication now in the public domain: Chisholm, Hugh, ed. (1911). "Lennox" . Encyclopædia Britannica. 16 (11th ed.). Cambridge University Press. p. 420.